15 minutes is all you need to make this Quick Shrimp Pasta with Garlic Feta Sauce. 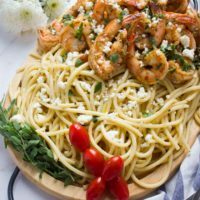 The shrimp is a burst of garlic, paprika, and oregano and served on a bed of pasta tossed in garlic, olive oil and feta cheese for a fresh taste of the Mediterranean! Cook the pasta according to the package directions. In the meantime toss the shrimp with all the spices and lemon juice, and saute them over high heat in a nonstick skillet for 5 minutes. Set aside. In another skillet, saute the garlic and olive oil for the pasta and then add in the cooked pasta to the skillet with about 1/2 cup of the pasta water and the feta cheese. Toss to create a sauce. When sauteeing the garlic, make sure it doesn't turn brown. This would make it taste bitter. Cook the pasta according to the instructions on the package but start checking it 2 minutes early to avoid overcooking. Feel free to use smoked Spanish paprika in this recipe for more depth of flavor and a sweet and smoky note.